The kids and I were busy choosing the cutest Pandora bracelets online when my attention was caught by an online promo sponsored by National Bookstore. 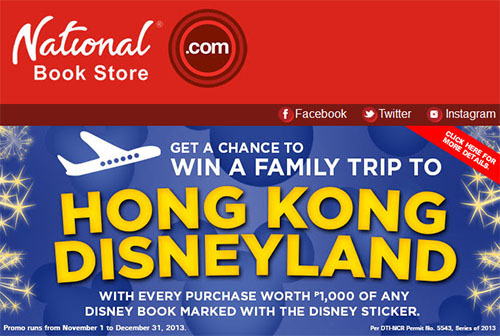 Visiting Hong Kong Disneyland is one of the kids’ biggest dreams and who knows by joining this contest their long-time dream would soon be realized. The promo runs until December 31, so that gives us two more weeks to join. This entry was posted in Family, Online promotion, Places to visit, Themepark, Tourists destination and tagged family trip to hong kong disneyland, hong kong disneyland, online promo, promo on December 13, 2013 by Yami.